Posted December 3rd, 2017 by Mike Boyes & filed under Child Development, Early Social and Emotional development, Language Development, Language-Thought, Learning, Neuroscience. Description: You may have heard in and an Introductory Psychology course or in a Child Development course that when a mother talks to her infant (fathers too) the parent changes their vocal patterns by exaggerating aspects of their speech in what we sometimes call “Motherese.” You may have also heard or even seen video examples of how infants will babble conversationally and takes turns with their parent while the parent is talking to them. As well infants will synchronize their physical movements, so they match with the pace and tonal patterns in their parent’s speech when they are speaking to their infant. Given all of this, what might you predict about an infant’s brainwave patterns when their parent is looking at them and talking to them? Have a read through the article linked below and see what brainwave recordings of parents and infants interacting tell us about these interactions. 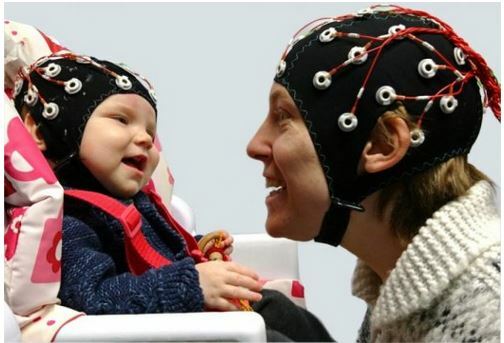 Source: Eye contact with your baby helps synchronize your brain-waves, Science News, ScienceDaily. So infant and parent brainwaves become synchronized when the parent is singing nursery rhymes to the infant but ONLY when they are making eye contact. What might we make of that? They key seems to be a mutual intention to communicate, signaled by eye contact. The synchronization did not occur when the parent was not making eye contact with the infant. It also seems that infants pick up on the deliberateness of the parent’s eye contact (when the parent’s face is slightly averted but they are still making eye contact). The infants also responded to eye contact by vocalizing more (again in turn-taking fashion). What might we make of this synchronization? One of the rsearchers indicates that while they are not sure what is driving the synchronization they are not yet thinking it is a form of telepathy. But is IS fascinating to consider what might be going on. Related work on empathy and mirror neurons might suggest that humans are prepared to engage in face-to-face communication and that the synchronization is an adaptive part of that process that assist with the processing of communicative context including things like body language. I was discussing this study with my wife, Erika, and she suggested a fascinating question. Given that one of the signature features of Autism Spectrum Disorder is a regular failure to make eye contact during social interactions it would also suggest that ASD individuals do not engage in this synchronization process while interacting with their parents or others. This gives rise to the question of what the impact of that lack of synchronization might be on the development of social understanding and on communication development and functioning in general for those with ASD. And, of course, one could also wonder if the lack of eye contact is simply a symptom of the disorder or, to some unknown extent, a contributory factor. What sorts of things “synchronize” when infants interact (have “conversations”) with their primary caregivers? How might vocal and movement synchronization relate to brainwave synchronization between infants and their primary caregivers? What might the relationship be between the lack of eye contact by children with ASD and others in social interaction and the development of communicative competence and social understanding on the part of the individual with an ASD diagnosis?